Gaining roof access is a safe and simple task when the roofing system is equipped with a commercial roof access hatch. Our company provides our clients with roof hatches specially designed for improved roof access safety. We also feature an array of access doors to accommodate a number of other access needs. Roof hatches provide you with safe access up to the roofing area of your commercial establishment. If you are installing new rooftop equipment or need to make roofing repairs, the presence of a roof access hatch will make it much easier for the contractor you hire to complete the job. When selecting a commercial roof access hatch, there are several different designs available. You can get a hatch with ladder access, ship stair access, or service stair access. You can also request the hatch itself to be solid or made of glass for a skylight effect. 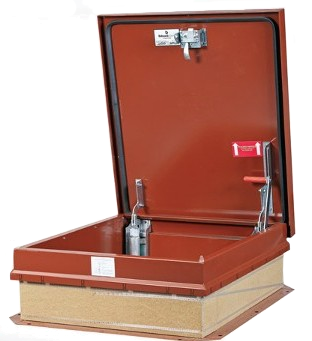 Adding a roof access hatch to your building structure is all about convenience and safety. Roofs by their very nature are hazardous areas. The higher the roof is, the more perilous the situation. That is why the hatches we offer are designed for maximum roof access safety. The fabrication process for these metal and aluminum hatches ensure they are extremely strong and durable. You can also include a number of roof hatch safety accessories, such as safety railings, posts, and nets. These features further increase the overall safety level when using a roof access hatch to enter or exit the rooftop area. Contact us today for more information about the available options for a commercial roof access hatch. We serve customers throughout Maryland including Annapolis, Baltimore, Columbia, Glen Burnie,and Pasadena.